The Minutes from the last annual meeting were approved as written. Hub Coordinator Judy Albright was not present, so President Matt Peake did the update. The hubs are all quite busy, and, interestingly, are all doing different things, from critiques to workshops to shows. Each hub has been asked to designate a social media team to photograph events and post information on our various social media sites. Two are still in need of a team: Champlain and Upper Valley. The Board has voted to designate a sum of money for each hub annually. The amount will be $100 plus $5 for each member. To access the money, the hub must apply to the board. Money will not be carried over to another year. However, it would be possible to get more than the initial amount if the hub applies for something specific and opens up the designated activity to the whole society. A special thank you to VPS: Central for hosting the Annual Membership meeting this year! Susannah Colby, Exhibits Chair, reported that the dates and venues for the two 2019 shows are a bit up in the air. The Wood Art Gallery has agreed to hold the member show September 3-27, but the dates need to be confirmed and possibly changed. She is working on dates for Valley Arts in Waitsfield for the juried show but may need to go to another venue. Currently they have reserved March 9-April 27 for us, but there was concern that there is very little activity in the Valley at that time. In 2020 we will have an exhibit at Southern Vermont Arts Center. We have an agreement with them to have an exhibit there every third year. The Board has decided to try an Online jurying process for our Juried Shows. This will save Susannah many hours (she currently spends about 400 hours annually on all her duties). This means that artists will submit their images to this site, but we will still hire our own jurors and judges and have the actual show in a real gallery. There will be a fee to the VPS of $125 to set up the process. The members would pay a $15 entry fee for each piece. It was agreed to begin this method in 2019. There was a discussion about having shorter and more specific times for pick up and drop off of paintings for exhibits. Susannah will work with each gallery on this, since we cannot dictate policies to them. It was suggested that it would be great if everyone could see the whole show online. Joyce Kahn is coordinating the McKinley workshop. It will be open to everyone, not just people who have taken a workshop with him previously. She will begin advertising around the first of the year and expects to hold a lottery to determine who will attend. Linda Masten is arranging the Jacob Aguiar workshop. It was reported that the Board has voted to establish a member scholarship. Every year VPS will designate an amount to be used for scholarships for VPS sponsored workshops. The money can be given to one person or divided up and given to several, depending upon need and the cost of the workshops. All VPS members, except Board members, are eligible to apply for consideration. Members interested in applying should fill out the form which will be on the website and include a short paragraph outlining their interest in attending the workshop and how they would benefit from attendance. Applications can be made any time after the workshops are announced, up to two months before the desired workshop begins. All application information is strictly confidential. Scholarships will be awarded by a designated Scholarship Committee, headed by one of the Board Members-at-Large. Scholarship recipients must wait two years before they apply again. Webmaster Cindy Griffith reported that since our website was hacked it has been made much safer. She is exploring using PayPal to pay for membership. She indicated that she would very much like an assistant or someone to take over the job entirely. John Landy volunteered to help her. Cindy also mentioned that members who want to change their bios or artwork, should send her the new information. Treasurer Linda Masten presented the budget report. VPS has a total of $21, 290. The group discussed jurors’ fees and agreed that we should increase what we pay. Susannah will research typical fees for jurors and judges and give that information to the board. Matt had previously sent out the changes for comment, and, receiving none, called for a vote on the changes as written. They were passed unanimously. All of these people are currently incumbents and have agreed to serve another term. In addition, there is a one-year member-at-large position to fill out a term. Shelley DuBois has been nominated for that position. After finding that there were no more nominations, Matt closed the nominations, and asked for a vote for the whole slate. The slate passed unanimously. The meeting adjourned at 1:32 p.m.
Matt called the meeting to order at 1:03 and welcomed Linda Masten as the new treasurer. The Board approved the minutes from the October 15, 2017 meeting, as well as the email meeting of April 2. 1.Hubs update: Matt began the update, and then when she arrived, Judy continued it. a. Hub activity: There is a great variation of activities in the hubs, from regular critiques, to monthly activities to shows. The hope is that hubs will get ideas from other hubs via the updates that Judy sends out. b. Social Media Team: Each hub was asked to talk about choosing two or more people to become familiar with posting on the VPS Instagram (IG) platform, but only two hubs have done so to date. Matt, Susannah, and Maggie all have the password and would be happy to share it with others. We need to get the hubs to agree to this. Those who are interested, should contact their hub point person who can set up a meeting with Susannah Colby to learn how to post to IG. We need two people from each hub to be on the Hub’s Social Media Team to take pictures of hub activities and post them to our social media sites. Judy will contact the point person/people to get two volunteers per hub. Joyce Kahn volunteered for her hub. c. Misc. : Since the next show will be in Rutland, VPS MidState will be in charge of receiving the paintings, the reception, photographing, etc. Individuals who wish may post information about their own shows. 2.Exhibitions update: In Susannah’s absence, Matt gave the update. a., b. As reported previously, we are all set for the 2018 shows: both the members’ exhibition (to be held at the Chaffee Art Center in Rutland) and the juried show (to be held in Bennington). c. Plans for 2019 are up in the air, but for 2020 we are planning to have the Members’ Exhibition in conjunction with the New Hampshire Pastel Society at the AVA Gallery in Lebanon, NH. a) Linda reported on the Alain Picard workshop, which was a great success, both financially and educationally. The net profit was $3, 067.57. She recommended visiting his website to watch the helpful videos he has created. b) Karen Margulis workshop: the workshop is filling up fast and will almost definitely be sold out. The Board discussed what to do about the evaluation forms, and it was decided that Grace Cothalis will compile information on the artists, venues, and suggested workshop presenters and topics. c) Workshops for 2019 and 2020: Joyce is in touch with Richard McKinley about a follow-up workshop in 2019 to the one he gave last year. d) Grace Greene brought up the possibility of giving scholarships to attend one of our workshops. She reported that both New Hampshire and Maine give scholarships, as cited on their websites. The Board was supportive of the idea but had a lot of questions about how the selection would be made. Grace agreed to contact both of those pastel societies to find out how they do it, and then make a proposal to the Board at the fall meeting. e) Policy for refunds when a participant cannot attend a workshop at the last moment: If there is someone on the waiting list who can take the spot, then the entire amount will be refunded. If not, then this needs to be decided on a case by case basis, in consultation with Matt and Grace C. The decision will be made in as compassionate a manner as possible. 4. Webmaster report: Cindy was not able to attend this meeting but reported that things have been quiet since the website was hacked and subsequently fixed. Also, since then she has not done anything about looking into using PayPal. Maggie agreed to try to get it going again. Cindy also asked the Board to find someone to work with her, or to take over completely. Some board members think that the website needs to be updated already and that it is text heavy and hard to navigate. Others expressed the opinion that Cindy had done an excellent job, and that it was too early to overhaul the website again. Several people volunteered to talk to friends and neighbors about costs for redoing the website. These volunteers will send their findings to Matt, and he will compile the info. for the Board. The Board discussed the idea of offering to put links on our website to companies which donate prizes for our shows. The idea was unanimously approved. Matt will ask DeeDee and Pat for the list of companies that donated prizes for the members’ exhibit this year, and Cindy has agreed to add the links to our website. Google calendar: Judy will remind hub point people about the existence of and the uses for our Google Calendar. 5. Placement of information: what goes where? Matt informed the board of the variety of requests he receives from various parties for dissemination of information to our membership—from parades to workshops to merchandise for sale. a) These things should be put on our Facebook page: non-VPS workshops, such as the U-art workshop in Wilmington; past-VPS members’ workshops, such as Robert Carsten’s; offerings from other area pastel societies, and shows in Vermont venues. b) The Board voted to renew the contract with Constant Contact, which costs $160.00/year. 6. Treasurer’s report: Linda Masten has just taken over from Norma, so is learning the ins and outs. She reported that as of May 1, there was $19,169.62 in our account, plus we have a $10,000 CD. Matt had one question about an exhibit line item, and Linda will ask Norma about it. 7. Gifts to individuals for service to the board. This passed quickly and unanimously. a) Brochures: Do we want/ need them? The current one is outdated. It was decided to have a rack card instead, and that Judy will design it and Maggie will write the text. b) Business cards: are they needed? The Board decided that the rack cards would replace business cards, too. c) Student rate for membership: Susannah proposed this idea, and the Board agreed to offer a student membership for half price, or $20.00. d) Should we keep a PO Box in Montpelier? Yes, and Joyce Kahn will continue to check on it regularly. It was decided to establish an honorary membership category instead or a lifetime one. There will be no stated criteria; for someone to achieve this status, a board member must write a letter nominating a person and explain why that person should be given the honorary membership. Then, the Board will vote on it. If the person is granted honorary membership, he or she will receive a congratulatory letter from the VPS president. Maggie will establish an honorary membership category. 10. Annual Meeting: The annual meeting will we held in mid-October from 1:00-4:00, with a business meeting and then a demonstration. Judy will check on possible locations in Middlebury. The Board is asked to suggest names for possible presenters at that meeting. Matt adjourned the meeting at 3:22. The minutes of the VPS Annual Meeting (11/6/16) and Email meetings of 4-28-17 and 5-4-17 (see VPS website at https://vermontpastelsociety.com/vps-meeting-minutes/) were approved as written. Exhibitions Chair Susannah Colby reported on exhibits: The current juried show will be up at the Coolidge Hotel in White River Junction through December 27; so far two paintings have sold. For 2018 Susannah is in negotiations with the Chandler Arts Center in Randolph for the VPS Members’ Exhibition in May or early summer, and with the Bennington Center for the Arts for the VPS Juried Show in the fall. She is also working with the Pastel Society of New Hampshire to have a joint Members’ Exhibition with VPS at the AVA Gallery in Lebanon in the fall of 2020, and to have a VPS Juried Show in 2020 at the Southern Vermont Arts Center. Alain Picard, April 23-27 in Bennington at the Bennington Art Center (three days of landscapes and two of portraits), organized by Linda Masten. Linda recommended signing up for his free monthly newsletter which contains links to educational videos he has created. Richard McKinley, part two, August 6-10, East Montpelier, organized by Joyce Kahn. At present, this will be open only to people who have already taken a workshop with McKinley, although Joyce will be further clarifying this with him. 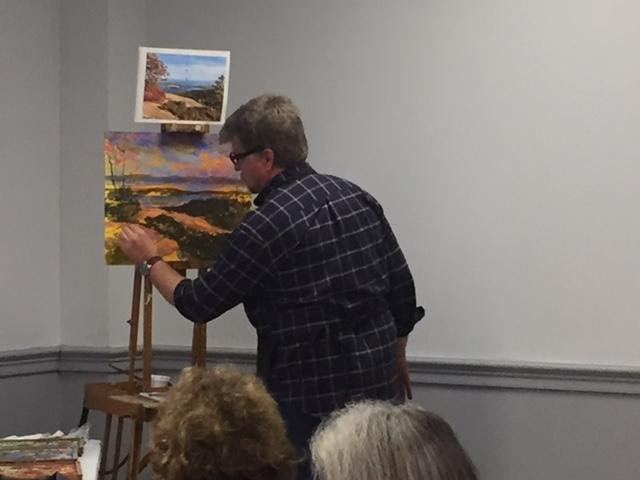 More information on these workshops will be on the website https://vermontpastelsociety.com/vps-workshops/and in general membership emails as it becomes available. Matt reported that VPS has a Facebook page (and also an Instagram account), but it is difficult, if not impossible, to upload photos, so the site needs to be cleaned up or re-created. Matt suggested we create a VPS Social Media team. A suggestion was made to have someone in each hub be responsible for posting things to Facebook. Both Maggie Smith and Susannah Colby volunteered to work with Carol Corliss on this. Judy Albright reported on the status of the hubs, first thanking Matt for his initiative and hard work in starting the groups. Judy has created and sent out thirty-six “Hub Happenings” since June, with a 70-80% opening rate. Treasurer Norma Rollet reviewed the budget, showing that we did well on workshop fees this year. We have increased the annual membership fee from $30 to $40 to help cover the increases in pay for judges and jurors and the increased costs to rent venues for our shows and meetings. Norma reiterated that we must make money on the workshops we offer, not just break even. The budget passed unanimously. Matt presented changes to the bylaws to accommodate the job descriptions for the two new positions on the Board. They passed unanimously. At this point thanks were given to Wendy Soliday who is going off the board after many years of service. Most recently she was a member at large, but she has held several other positions over the years. She was not able to be present at this meeting, but will receive a thank you gift at a later date. Sean Dye added his thanks and praise to Matt’s, saying that Wendy was probably responsible for keeping the organization together during the lean years. Maggie Smith reported that we have 108 members. She talked about sending out a members’ list to the entire membership. Members will have the opportunity to opt out of being included in that list. She will send out the list immediately, and then twice a year, in January and June. Meanwhile, she encouraged the members present to pay their dues today. Matt Peake adjourned the meeting at 3:45p.m., and introduced Sean Dye, “The Master of Vibrancy” who then did a one-and-a-half-hour demonstration. Present: Matthew Peake, Cindy Griffith, Maggie Smith, Joyce Kahn, Judy Albright, Grace Cothalis, Grace Greene. President Matthew Peake called the meeting to order at 2:10. Minutes: The minutes of the VPS Board meeting of May 15, 2017 and of email meetings of 4/28-5/1/17 and 5/4-5/7/17 were approved. Hubs: Judy and Matt reviewed her report on the hubs, with all congratulating them both on how well the hubs and the reporting on the hubs are going. Judy said that Constant Contact is available to other board members, and she will be happy to train anyone who is interested. There was discussion on what logos hubs should use for their activities. Judy presented some samples, but it was agreed that Grace Cothalis will work on another possibility. The idea is to incorporate hub information into the middle of the VPS banner, so both the larger society and the subset will be recognized. There was general discussion about guidelines for workshop planners. We must make a profit, and the organizers should plan for something to go wrong so there is no financial trouble at the last minute. Next year we will have Richard McKinley back to do a follow up to the workshop he did last year. Joyce Kahn will organize this, and advertise it out of Vermont so as to make sure we have enough attendees (since it will be required that attendees have already taken a workshop of his). Linda Masten, who organized this year’s Desmond O’Hagen’s workshop, has submitted a proposal for a workshop in 2018 by Alain Picard. She is suggesting having two parts: a three-day landscape workshop, and a two-day portrait workshop. Artists can take either or both. The Board looked over her proposal, and Grace C. was charged with talking to Linda again about adjusting some prices. There is also a workshop by Karen Margulis planned for the Hyde Park area by Diane M Szlachetka and Patti Braun in June. Some members had raised the question about the possibility of a hub piggybacking on to a planned workshop. The Board decided that it would be ok to add on something different such as a critique and demo, but not another workshop. It was proposed and agreed upon, that we should create a workshop evaluation form for the VPS. It will cover both the presenter and the venue. There was concern over the organization of the exhibit at Coolidge Hotel in White River Junction. We need a sign-in form, and more than one person to accept the paintings as they are dropped off. Possibilities: the hub where the exhibit is held could help the Exhibits chair; there could be a whole committee; one of the directors on the Board could automatically be assigned to help the Exhibits Chair. The new membership form should include a place for people to volunteer for committees. Membership list: This will be available to all members. Members who want to opt out will have the chance to do so. DVDs: There are directions on the website on how to borrow the DVDs, so there should not be any confusion. Matt and Carol talked over several issues surrounding the VPS Facebook page. We may need to restructure the page totally, or better, begin over because uploading has been difficult to impossible. The board also thought that VPS should have an Instagram account as well. It is possible that Carol Corliss would like help with this or she may want someone to take over VPS Social Media; Matt will ask Carol how we should proceed. We will ask for volunteers to work on the VPS Social Media at the Annual Meeting. Should we charge an entrance fee for the juried shows? It was decided that rather than do that, that we will raise our annual membership to $40 from $30. That way more people are encouraged to submit paintings to the juried shows. For comparison purposes, Maggie told us that New Hampshire has a $35 membership fee. There was discussion about adding PayPal to the website so people can pay for membership online. Cindy will look into this. The budget proposed by Norma looks good, but will need to be adjusted because of decisions made at the meeting today (e.g. raising the membership fee). The meeting adjourned at 4:25 p.m.
Motion was made by Norma Jean Rollet, seconded by Grace Greene, to approve the Bylaws changes as written below in bold. The Board of Directors shall consist of not less than three and no more than nine Officers. Proposed change: The Board of Directors shall consist of no fewer than three and no more than ten Officers. The Officers of the VPS shall consist of: President, Vice President, Treasurer, Secretary, Membership Secretary, and two Members at Large. Proposed change: The Officers of the VPS shall consist of: President, Vice President, Treasurer, Secretary, Membership Secretary, Exhibitions Director, Webmaster, Director of Hubs, and two Members at Large. Of 88 VPS members eligible to vote, 51 voted in favor of the motion, 1 against, and 36 abstained. Motion was made by Norma Jean Rollet and seconded by Grace Greene and Wendy Soliday, to nominate Judy Albright as the VPS Director of Hubs. Information about Judy Albright from her resume was provided as well as the job description for the Director of Hubs as below. The Director of Hubs will report to the President and be responsible for communication between Regional Hub Point Persons and the VPS Board. The Director of Hubs will coordinate information about Hub activities and pass that information along to the Webmaster, to the Membership Secretary, and/or to the VPS Facebook page editor depending on the need. The Director of Hubs will prepare a report for board meetings twice a year, describing the status of the regional hubs and their activities. The Director of Hubs will maintain contact with each hub point person, advising new Point People of their responsibilities; being a resource for Point People should questions or problems arise; participating in the replacement of Point People should the currently serving one step down. In essence, the Director of Hubs will oversee the VPS Regional Hub Program and work to maintain its stability and growth. Of the 89 VPS members eligible to vote, 50 voted in favor of the motion and 39 abstained. Before the meeting began, treasurer Norma Rollet made a plea to all who collect money for VPS not to hold on to it, but rather to send it to her ASAP. President Matt Peake formally began the meeting with introduction of our newest board member, Judy Albright, Hub Director, and then gave an update on the status of hubs. There are four that have been organized so far: Southeast (Brattleboro); Midstate (Middlebury/Rutland); Central (Montpelier area) and Upper Valley (White River Junction area). Next, Matt will be going to the Manchester/ Bennington area on Wednesday. All hubs are enthusiastic and have many ideas for activities and getting to know one another better. There are not enough members in the St. Johnsbury/Newport area, so the one artist who is there will be invited to join the Central Hub. There are a great many topics that VPS needs to communicate to its members: exhibits, shows, workshops and opportunities among them. There needs to be a better way of communicating and indicating what kind of communication each item is. There are currently: a website, a blog (connected to the website) a Facebook page (barely used) and emails on all kinds of news from the Membership Director. Judy Albright shared how Connecticut Pastel Society does their communications, and after much discussion, it was decided to adopt some of their methods. The main thing is that VPS will get a Constant Contact account (approximately $220) which will enable the organization to communicate in a more professional and consistent manner. Judy and Norma, who are both familiar with Constant Contact, will acquire the license, set up templates for communications (e.g. headings that specify whether the notice is about workshops, opportunities, etc.) and share access and templates with the Board members who need them. As Hub Director, Judy would like newsletter-like information from the hubs, such as a report on a workshop or show; she will compile all the hub information, and sent it out to the membership. Any information calling for ideas or organizing a hub activity will, on the other hand, only go out to hub members and will be sent by the local hub organizer. Constant Contact has many uses besides use as a newsletter; for instance, you can do surveys through it. In addition, there need to be clear guidelines about what the FB page is for. Carol Corliss tried to get members to send photos of work in progress, but no one did. Cindy will talk to Carol about creating guidelines. In very short order the Board declared that the V-Cube USA prices to record our meetings were too expensive, and that most of what we did would not lend itself to being videotaped anyhow. As for workshops, the presenters often make money selling their own videotapes, so would not allow VPS to tape them. Matt reviewed the information about the two workshops we have planned for this year: Desmond O’Hagan and Doug Dawson. Both are a go. There was discussion about finances, and it was re-stated that VPS should make money on all workshops, and that planners should allow for changes and the unexpected when creating a budget. In the case of the Desmond O’Hagan workshop, VPS will subsidize it by approximately $75, a small amount considering how hard the organizer worked to reduce the costs. The hubs have arranged for transportation of artists’ paintings to the Southern Vermont Art Center for drop off on May 20 and 21. The show will be up May 27-July 8 and the reception will be held on May 28 from 2:00-4:00. Last year there were approximately 100 members, but his year, in spite of several new people joining, we currently have only 89. There was discussion about what to do about this: call, email, letter, or what, and the decision was to send another email with another reminder. Cindy said they always used to send 3 or even 4 emails out, and that people just need several reminders (esp. artists!). The first action was to approve the minutes of last year’s annual meeting. They were approved unanimously. Cindy commended the great job by people who were responsible for setting up the exhibits and getting the awards: Matt Peake and Anne Unangst were co-chairs for exhibits and other members founds the extensive awards over the year. The Richard McKinley workshop was a success both artistically and financially. Because of the great interest in the workshop, Joyce Kahn, the organizer, used a lottery system which worked very well. Cindy next showed the group the new website which she has been working on for the last year: https://vermontpastelsociety.com/ There is a rotating gallery of one work per member on the first page, a member gallery, news about exhibits and the Society and lots more, including a membership form. Cindy was thanked and congratulated on all her excellent work. Norma Jean Rollet presented the treasurer’s report. The Society has a total of $15,438.11. The only changes from last year to this were minor, such as new line items for marketing and demonstrations, $300 for each. The budget was accepted as presented. end of the month. Members who were present were urged to renew at this meeting. Debra will be leaving this position. Thanks and gifts were given to Board members who were stepping down: Anne Unangst and Debra Kraemer. At this point, Cindy turned the meeting over to our new president, Matt Peake, who, with the help of Wendy Soliday, presented Cindy with a bag of small gifts to thank her for her years as president. Matt talked about plans for 2017, and ideas he has to increase membership. He may do a survey to find out what causes people to join and then stay or leave. We also need to look at look at our mission statement to see if we need to update it. In addition, he would like to find ways for people to get to know one another, and to this end introduced the idea of Regional Hubs of the VPS, a concept that the Vermont Watercolor Society has been successfully using for several years. Matt will look into using the idea with the VPS. Vice President Grace Cothalis discussed two workshops that members are putting together: one by Desmond O’Hagan at the end of June, and one by Doug Dawson in September. Each will be for three days. More info will follow. The new Exhibits Chair, Susannah Colby, presented plans for two shows in 2017: a members’ show at the Southern Vermont Art Center Manchester beginning at the end of May, and a juried show at the Hotel Coolidge in White River Junction in September. They do not yet know which room we will have at SVAC, so cannot say how many pieces can be hung. At the Coolidge, they can take approximately 30 pieces. Matt then led a discussion of possible activities for 2017 and beyond. We could compile a list of venues for shows. We could work with/ exhibit with the New Hampshire Pastel Society. We could encourage local gatherings such as the one Wendy Soliday did at her house when she showed a DVD from the VPS collection and artists gathered to paint. Mallory Rich (malloryrich57@gmail.com) suggested a paint out such as the one that the Emil Gruppe Gallery does annually in Jericho. She will look into the possibility of us doing this; we have money to pursue it. There was a lot of enthusiasm for trying new activities, and the membership gave Matt the green light to look into ways to increase our visibility and opportunities. The meeting ended with a suggestion of taking VPS brochures to distribute to art stores and at classes and workshops.